Shao, H. and Lok, J. B. (2014). Detection of piggyBac-mediated Transposition by Splinkerette PCR in Transgenic Lines of Strongyloides ratti. Bio-protocol 4(1): e1015. DOI: 10.21769/BioProtoc.1015. Shao, H., Li, X., Nolan, T. J., Massey, H. C., Jr., Pearce, E. J. and Lok, J. B. (2012). Transposon-mediated chromosomal integration of transgenes in the parasitic nematode Strongyloides ratti and establishment of stable transgenic lines. 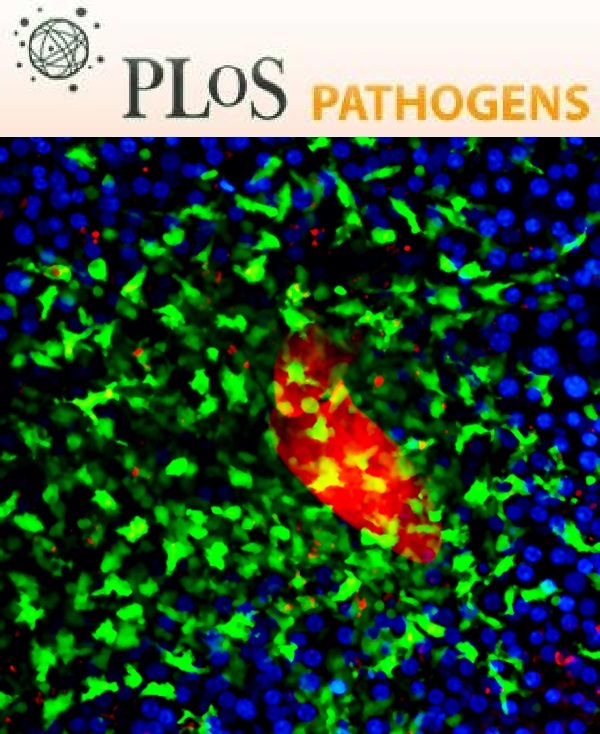 PLoS Pathog 8(8): e1002871. Splinkerette PCR (spPCR) is a newly developed and efficient method to ascertain and characterize genomic insertion sites of transgenes. The method described in this protocol was successfully applied to confirm piggyBac transposon-mediated integration of transgenes into chromosomes of the parasitic nematode Strongyloides ratti. This work is described in detail in Shao et al. (2012) and presented here in a simplified diagram (Figure 1). Using this method, chromosomal loci of integration were determined based on target site and 5’- and 3’ flanking sequences. Therefore, spPCR can be a useful method to confirm integrative transgenesis in functional genomic studies of parasitic nematodes. Potter and Luo (2010) contains a protocol for use of spPCR to detect and map piggyBac transposon-mediated chromosomal integrations in Drosophila, and was the source of our method for Strongyloides. The splinkerette- and piggyBac-specific oligos described in that reference could be used without modification in Strongyloides. For interested readers, a general review of the biology of parasitic nematodes in the genus Strongyloides may be found in Viney and Lok (2007), and a methods-based article on S. stercoralis as an experimental model, with information on transgenesis, may be found in Lok (2007). Collect stably transformed free-living adult Strongyloides from charcoal cultures of fresh host feces incubated at 22 °C for 48 h (Lok, 2007). Extract genomic DNA (gDNA) from ~500 free-living adult worms using the Gentra Puregene Tissue Kit. Parasites do not need to be homogenized. Isolated worms are pelleted at 14,000 x g and then substituted for the “ground tissue” in step 2, followed by step 2b of the manufacturer’s protocol accompanying the Gentra Puregene Tissue Kit, using reagent volumes recommended for tissue samples of 5-10 mg. Resuspend extracted gDNA in 50 μl TE buffer (10 mM Tris-HCl, 1 mM EDTA, pH 8.0) to yield ~ 25 ng/μl. Digest Genomic DNA (~100 ng) with BstYI, BamHI, and Bgl II for 2 h in a total volume of 15 μl for each reaction (Figure 1A). Follow manufacturer’s instructions for reaction conditions and inactivation steps for each restriction enzyme. Add 5 μl of 100 μM SPLINK-BOT oligonucleotide, 5 μl 100 μM SPLINK-GATC-TOP oligonucleotide and 10x NEB Buffer 2 in a total reaction volume of 100 μl. Heat to 95 °C for 3 min then cool on bench to room temperature to anneal splinkerette oligonucleotides. Ligate digested gDNA with GATC sticky ends to annealed splinkerette oligonucleotides using T4 ligase for 8 h at 16 °C in a total volume of 30 μl (Figure 1B). Two rounds of spPCR are conducted following ligation of genomic DNA restriction fragments to splinkerette oligo nucleotides. a final extension at 72 °C for 10 min. The second round of spPCR is nested PCR carried out with primer SPLNK#2 paired with either primer 3’SPLNK-PB#2 or primer 5’SPLNK-PB#2 and a 1:20 dilution of spPCR products from the first-round spPCR as template. Carry out the second-round amplification with Phusion High-Fidelity DNA Polymerase using the same thermal cycling conditions as specified for first-round spPCR. Analyze all PCR products by 1% agarose gel electrophoresis. Incubate the products of second-round spPCR with 1 μl Shrimp Alkaline Phosphatase (1 U/ml) and 1 μl Exonuclease I (20,000 U/ml) at 37 °C for 2 h, and then at 80 °C for 15 min (Figure 1C). Sequence the treated PCR products directly using primers 3’SPLNK-PB-SEQ and 5’SPLNK-PB-SEQ, targeting the 3’ and 5’ ends of the transgene sequence, respectively. Identify chromosomal locations of integrations based on generated sequences and matching fragments in the genome database (Figure 1D, 1E). This protocol details methods originally published in Shao et al. (2012). This work was funded by grant number AI050668 from the US National Institutes of Health. Lok, J. B. Strongyloides stercoralis: a model for translational research on parasitic nematode biology (February 17, 2007), WormBook, ed. The C. elegans Research Community, WormBook, doi/10.1895/wormbook.1.134.1, http://www.wormbook.org. Potter, C. J. and Luo, L. (2010). 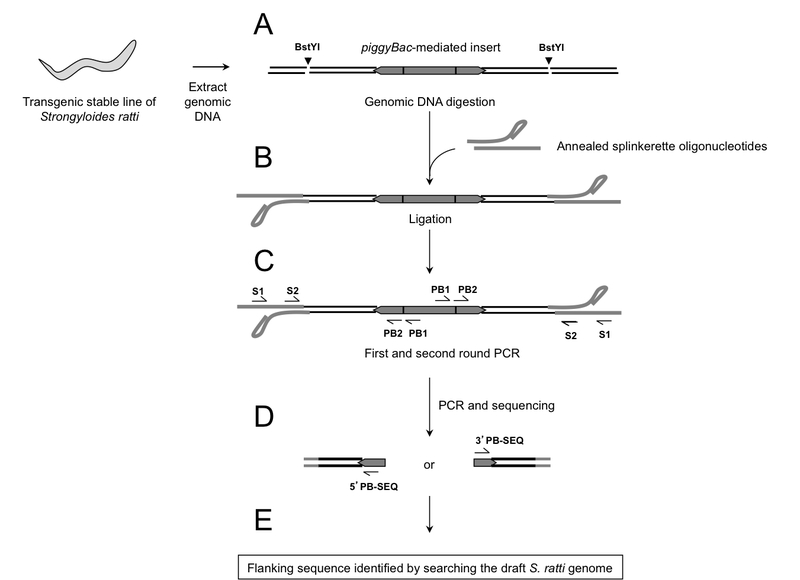 Splinkerette PCR for mapping transposable elements in Drosophila. PLoS One 5(4): e10168. Viney, M. E. and Lok, J. B. Strongyloides spp. (May 23, 2007), WormBook, ed. The C. elegans Research Community, WormBook, doi/10.1895/wormbook.1.141.1, http://www.wormbook.org.